The call for Platforms 2016 was open to artists living and working in the Pacific Northwest, including British Columbia and Washington. We warmly welcome submissions from Aboriginal artists and artists of diverse communities and backgrounds. Artists are defined as individuals who have completed basic training in visual arts and have an art practice recognized by peers in their field. Experience with public art is not required. Up to 15 artists were shortlisted and asked to develop a full concept plan for approval before completing the work. Short-listed artists were paid an honorarium of $1,500 CAD to develop a detailed plan or storyboard for review and final selection. The honorarium forms part of the commission fee of $5,000 CDN when a work proceeds. A schedule of deadlines for specific works was developed. 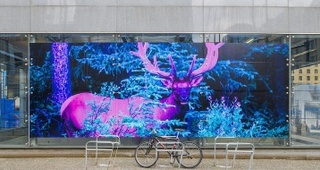 The City is responsible for production and installation of the artwork. US artists are subject to withholding tax.